It was a night of firsts in the midterm elections as US voters elected two Muslim women, two Native American women and their first openly gay governor. The election of two Muslim women, both Democrats, to Congress, marks a historic first in a country where anti-Muslim rhetoric has been on the rise. 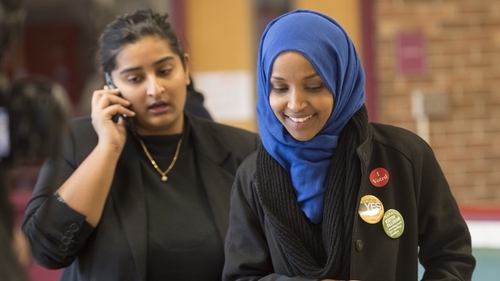 Ilhan Omar, a Somali refugee, won a House of Representatives seat in a heavily-Democratic district in the Midwestern state of Minnesota, where she will succeed Keith Ellison, himself the first Muslim elected to Congress. Rashida Tlaib, a social worker born in Detroit to Palestinian immigrant parents, won a seat in a district where she ran unopposed by a Republican candidate. The two politicians will increase the total number of Muslims in the house to three. Congressman Andre Carson, who is Muslim and African American, won re-election in his safely-Democratic district in the state of Indiana. The Council on American-Islamic Relations (CAIR) reported a 21% increase in anti-Muslim hate crimes in the first six months of 2018. Sharice Davids and Deb Haaland also broke new ground, becoming the first Native American women elected to Congress, US networks projected. Ms Davids, 38, of Kansas, is an attorney by training and a former mixed martial arts fighter. She is also openly lesbian, in a state that is traditionally conservative. She defeated Republican incumbent Kevin Yoder. Ms Haaland, 57, of New Mexico, beat Janice Arnold-Jones, a Republican, and Lloyd Princeton, a Libertarian. Elsewhere, Democratic Congressman Jared Polis won the governor's race in Colorado, US media projected, making him the first openly gay person to be elected governor in the United States. The five-term congressman, who defeated Republican Walker Stapleton, was open about his sexual orientation during the campaign, often referring to it in his criticism of US President Donald Trump. A self-made millionaire and tech entrepreneur, Mr Polis was admitted to Princeton at age 16 and has said that he set his sights on becoming governor when he was in college.